Blog | ERICKSONG ARCHITECTS INC. The story ends. The bylaws weren't such a big deal after it. The Tseng's got to keep their addition. Finally, the Tsengs argued under section 45(1) of the city’s Planning Act that contemplates the possibility of a minor variance” under the bylaw. Many houses violate the city’s bylaw for depth of a house, set at 14 to 17 metres. 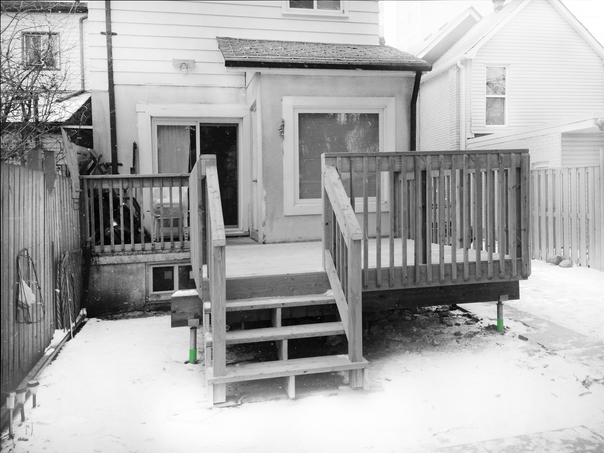 Since the Tsengs’ house was already in violation of the bylaw, it seems the OMB allowed this addition to stand. The OMB won't explain the rationale because “decisions issued by the OMB are considered ‘res ipsa loquitur’ — the thing speaks for itself,” according to its website. The board, in effect, said the addition was good enough to fit into the neighborhood's look and feel, building permits be damned. "�Liam Casey, The Star. �December 7, 2013. The claims of this couple seem unbelievable. The daughter's a lawyer, and Mr. Tseng is a retired realtor, but somehow the couple proceeded without a simple building permit, extending their house 10 meters or 30 feet too far! Just sell and move? No, the couple's mental instability prevents them from moving, as they might commit suicide. Runs in the family it seems. This case, in an extreme way, reflects a shade in my architectural practice today. I've had a few clients �who have been ticketed as the Tsengs have, some innocently, and some deservedly. �Are the zoning by-laws such a big deal? Why not just let the Tsengs get away with it? If true, I can't believe that such frailty isn't being handled by careful arbitration, not litigation. An advocate of the elderly can expedite a solution with a more appropriate house, or added senior care. Something tells me there is a reason this has become a distorted court case, instead of a humanitarian care case. Complex zoning by-laws lurk behind the purchase of property for some buyers. Lawyers, real estate agents and home inspectors don't do the due diligence when it comes to building permits, relying on their title insurance to protect them. Partially this can be said to be due to our system of professional education and the separation of disciplines. I would hope someday this could improve. 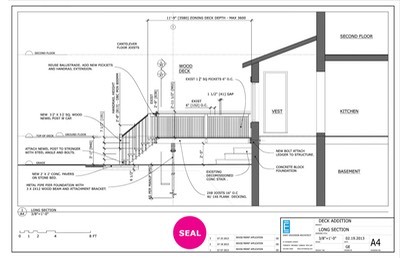 Even in a renovation after purchase, some less careful owners feel that they can game the system by avoiding site plan control, conservation, ravine protection and the careful due diligence of the building permit system. In flirting with a renovation, they wake up the sleeping giant of their local government. Then too late, they can become tagged by our system as a problem case, with possible double permit fees, and extra inspections. This can work out well, as they may need the extra advice, and the fees are not high. "All Western economies haven’t suffered the same pain [lack of cohesion, financial failure], some of them are moving forward — and the most notable are places that continue to have an active state, industrial policy, national planning. I’m thinking of Denmark, Norway, even Germany. These guys are doing better." Frank Graves, �The Star,�Saturday, December 7, 2013. 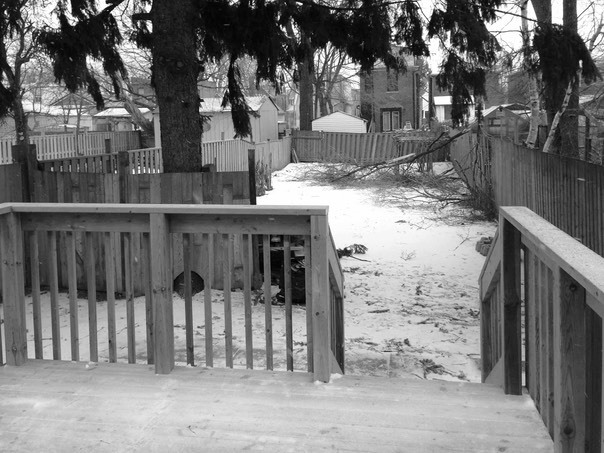 Still cries of government exploitation and a heavy handed approach come to those ticketed by the city for bylaw infractions, such as poking out way too far into the backyard, as the Tsengs did. Notwithstanding the benifits of government control on construction, putting the load of paying for government control on homeowners is seen as unfair. Yes it is a user pay system, but the middle class homeowner is becoming progressively poorer due to the agenda. New canadians come to Canada for a better life, not to finance our lofty ambitions for "world class" dominance. The cost of development is benchmarked to the large scale plans for citywide development fostered by those who benefit most from urban growth, large corporate and government capital. These plans are sold back to us by our elected officials as necessary changes. How necessary are they? How necessary is a pro-growth agenda? Is more simply better? Jet planes, casinos, subways, subways? Homeowners shouldn't be paying for escalating regulation and aggressive city-state building through fees and property taxes. 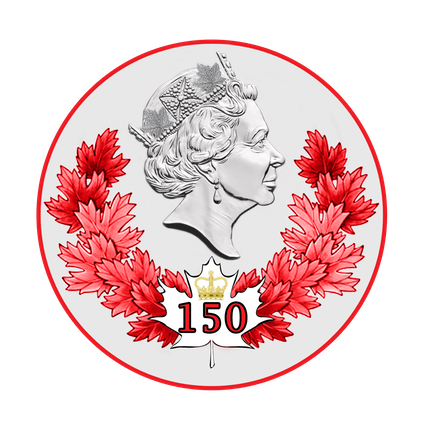 Our federal government should either financially assist with its own "Toronto Finance Act" , or start decentering our growth from Ontario to other provinces with better reserve funds, like Saskatchewan or Alberta. They have great cities too. 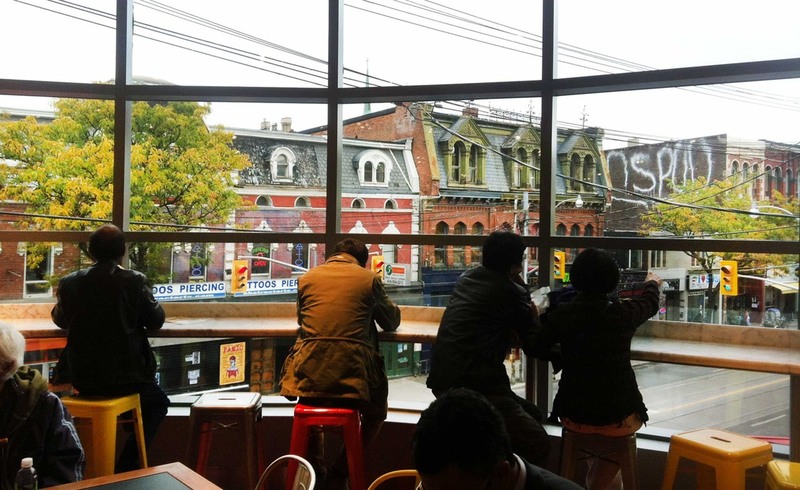 We have all waited a very long time for the Loblaws on Queen West. Rio-Can switched it up from its previous sunny parking lot. That lot saw many hip hop festival moments, no more. We looked across Queen Street from the window of Tequila Bookworm at the display of contractor forces.�What will they come up with on this most rare of corner lots? Classical, Modern, whatever? There are listed heritage buildings on all sides. What will now fill the Tequila Bookworm view, gazed out of by up and coming canadian poets, writers, artists, singers, and actors? 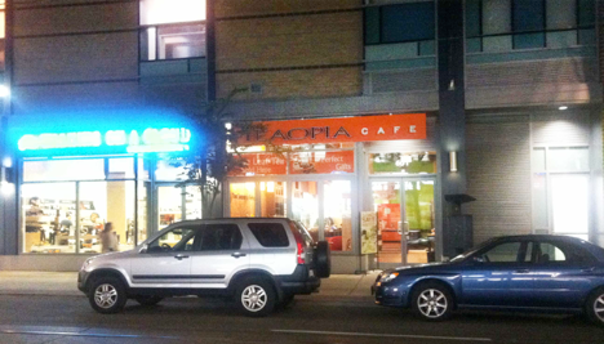 Answer brightly - LOBLAWS - WINNERS -RIOCAN - SHOPPES ON QUEEN WEST. "The Man is taking over Queen Street", or so says the conspiracy theorist bartender with that political science degree from U of T.
The new view from Tequila Bookworm. Oh yes, I hear Joe Fresh and Winners is OK too. The elevators and escalators are many and modern. The interior concept is generous. As for urban planning, the actual Queen West�Heritage Conservation District (HCD) is east of here on the other side of Spadina avenue. It was hoped that the HCD guidelines would extend further down Queen, helping the urban promenade. Parts of that effort has not happened here. Rio-Can could have followed the guidelines more closely. I'll explain. With that last connection, the vision of the glowing LOBLAWS sign will be the turning point to the waterfront. It can be seen from a mile away. "Turn left at the Loblaws sign" could be told to lost tourists. This is an unintended landmark. For those planning types, I've composed a night/day photo collage comparing the old north side heritage buildings with the new south side. This should clarify the historical context. The infraction list follows, one number at a time. One may have to zoom in a bit to see them. Queen and Portland infraction montage. 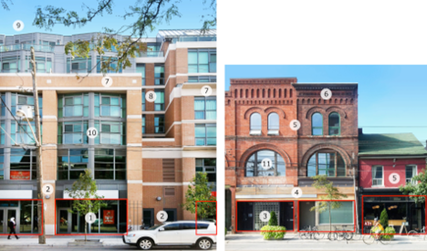 Speaking of context in detail, as you see by area 1, north side, glazed storefronts are the norm. Tequila Bookworm, even has a rolling garage door. Next door, in the infamous Velvet Underground nightclub below area 6, bars cover the windows. This adds mystery to the dark goth acts inside, like teenagers in black listening to loud music. �Still the decorative grill is very metalesque, reminding only me of Islamic mashrabiya. We can credit our local artist Yanis Ertmanis with this inspired goth facade design, with �silver heads, custom metal Velvet logo and spikes. Yanis says they are 9 inch nails. Yes, thats very funny Yanis. 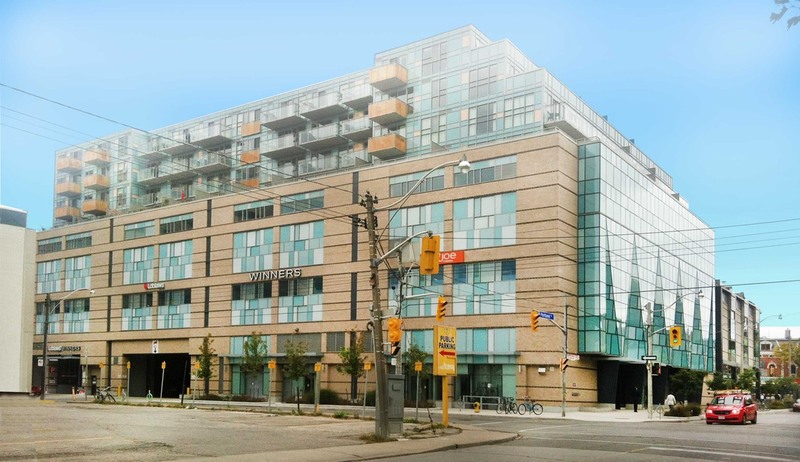 Comparing the Loblaws side, the glazing ratio is not too bad, in that it has large glass windows to the street. During business hours, it can light the street at night. �There are even some wall mounted up/down lights, making the texture visible. Problematically there's nothing much to see yet in most of those windows, except for a Joe Fresh display, shown in area 2, comprised of some shoes glue-gunned to a wall. Please try and switch up your window display occasionally Joe. There are lots of talented window dressers along the street for hire. Street facade mid block with BOM hours. Still that's better than the Bank of Montreal, who has turned their retail display into a sign, covering a bank machine, with white letters on a blue background. The required display window is now the banking hours, in one foot high white letters. �Yes we know your open. Great. My apologies to the other tenants like the graceful little Teaopia. The brown brick string courses ring the building, but mock the sucessfull design of the glazed bays in the front, an unnecesseary undergrid. The horizontal brick string courses may be a device in a traitional brick wall, but here in this floating fragment they have no meaning. Too many grids collide, magnifying design errors. Grids make your mistakes measurable. A plain sculpted brick panel would have been better. Everwhere on Queen, architects long gone understood they didn't have to apologeticaly candystripe their brick walls. A nice massive plain wall background was used as datum to decorated openings. Sometimes the well meaning HCD guidelines are misleading. Walk down Queen one day and look up. You will see a rich language of facade design by generations of talented Canadian architects and meticulous creative craftsmen. Getting back to our facade, the grey shingle pattern above the whole facade used as a metal cornice, has a lot of precedent along the street, courtesy of the classic french mansard roof. I suppose the huge size of them is a byproduct of this "postmodern ironic quotation." Maybe they just ran out of the nice smaller shingles. No matter, they don't fit on the bays windows too well. There are quotes at the bottom of this blog, with HCD guideines on facade design quoted for reference. As for entry security that is a deeper question. In Seattle, presented with a large population of transient people, building owners have hired "blackshirts" or private security forces to police the entries of buildings. As we don't support private police in Toronto, the slower response of 911 will do. Jane Jacobs wrote about the need to protect the street from the "barbarism" of crime , or suffer the gradual breakdown of urban areas, and the desiccation of the core. We Canadians, spared the brutality if the American system, seem to want to tolerate those random acts of civil disobedience, as long as they are not too prevalent. Signage and sign background standards and permits are vital to any major street. In area 4, the Loblaws and Winner signs, are twice as large in cap height as they should be.�One inch of sign cap height is worth 10 feet of viewing distance, assuming average vision. The elderly may need more. To compare, look at the sensitive treatment of signage in the heritage building across the street. The sign band area is the height the street signs are allowed to exist. This is to prevent a collage of words jumping around the environment. �There are some cheaters there too. 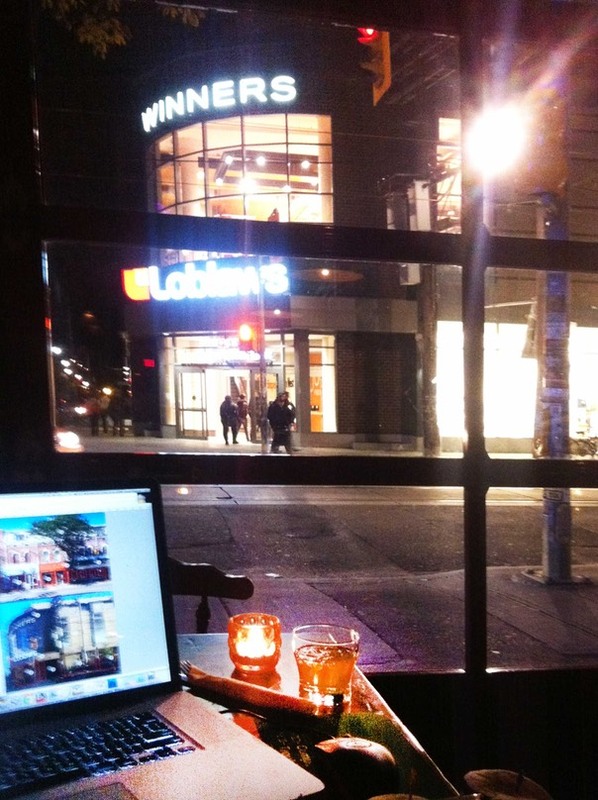 The amount of light coming from the Loblaws entry signs and the corner window is very dominating. 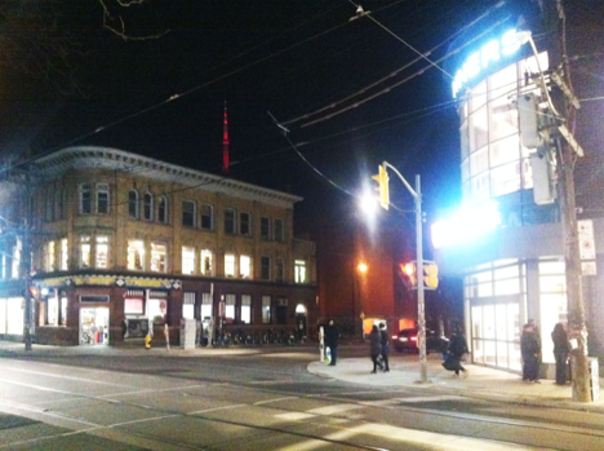 Luckily for Loblaws the buildings around them need lighting, to show off their heritage character at night. As an urban night lighting strategy I find this is poor. Light levels should be consistent and low, with some detail lighting given to the upper levels of heritage features, or newer modern roof flourishes. In areas 11 and 12, some low level detail LED lights can support the detail. Vegas waits with a cynical laugh. 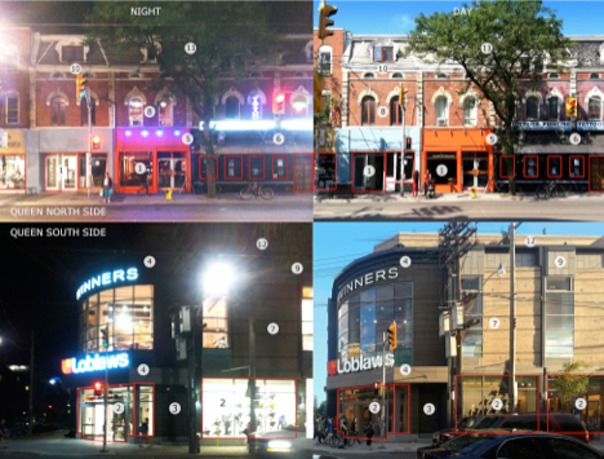 The blast of light from Loblaws and Winners signage and windows. Infraction 4: Entry signage poor. Both signage too bright, and building address over entry illegible and an afterthought. Never mind the over bright florescent signs right above the door, the building number was left out of the design till the very last. Ok, a pet peeve of mine, true. The number was squeezed in above the signage, and actually goes across a window mullion. Ok, it could be just a stand in till the real building number gets here. So far no change though. Oh well. The building number should be a clear and decorative design, and made of good materials that weather well. I've never seen one spell out the whole street name. Possibly there is confusion over the address at the corner entry. This whole sign would have been better in cutout or fabricated letters, separately lit. Mostly pedestrians, not drivers, are going to be looking at the entry sign, and pedestrians can read pretty well at the slow speeds their going. Internally illuminated signs are for cars driving by at speed at night, like the highway strip malls that this kind of signage was designed for. True heritage conservation districts dont allow this kind of thing. That means you too Shoppers Drug Mart. 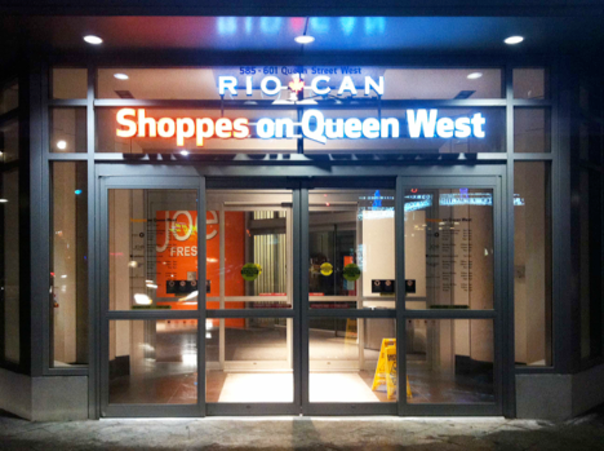 The loud florescent RioCan sign is installed without thought of a building address. It appears in vinyl just above. Hint: When on Queen West, it's not necessary to say "Queen West". People already know what street they are on when they get there. It's just not cool to put it on signage. And, if you just have to say it, don't say it twice please. Its retarded. Imagine your naming concept being repeated many times. "Bars on Queen West"…"Galleries on Queen West". It's suburban naming poverty. When in doubt, don't be shy, name it after yourself. How about "Sonshine Shops" after Riocan's CEO. Proper names can have a rich historical connotation. See Honest Eds. Now as for the work "Shoppes", letters in your face, bright and a foot high. The term is appropriate in a group of cute old boutiques, preferably in a small old english town. Stacked, bright orange, big box stores in downtown Toronto may not deserve it. �This is where well meaning mimicry can get one into trouble, almost like a sarcastic pun on "Shoppes." �Not funny. Even though I disagree with the size and type of signs chosen on heritage grounds, I appreciate the good quality and attention to detail made by the sign manufacturers. Not their fault. Infraction 5: Roof line design poor, and badly lit in either case. As a continuation of the new street wall on Queen, the metal panels in area 9 are not proportioned to be a cornice line as in area 10, if that is what it is trying to emulate. The unit size of the texture is too large for the cornice elements. Both old and new facades don't capitalize on their form at night. Cornice lines could be occasonally dimly lit for effect on both old and new buildings at higher levels, keeping in mind people are trying to sleep up there of course. Infraction 6: Landscaping has little night lighting. Infraction 7: The mullion view block. 2nd level cafe on a rainy fall day. Infraction 8: Is a post modern design out of date? The back and condo entry corner, with teal and ochre glass, and folded curtainwall. The decorative strategies of this architectural style were invented to react against the brutalist appearace of a late modern architecture, and that means grey concrete. The architect was instructed to quote the ancient catalog of academic historical imagery, while cartooning them with contemporary colours, materials and scale. Today's relatively cheap construction, realtive to the orignal noble stone and bronze, can make these decorative features look cynical. Add the death of craft in fine masonry and sculpted decoration, and this makes the strategy difficult to execute. Isn't this the challenge of Queen Street West: the struggle to be different with much more freedom than money? �The ideas of the perversely decorative, contrarian and mannerist style championed by Michael Graves in Portland City Hall, or a signage driven consumerism by Venturi and Brown in Learning from Las Vegas, can still be comercially valid. 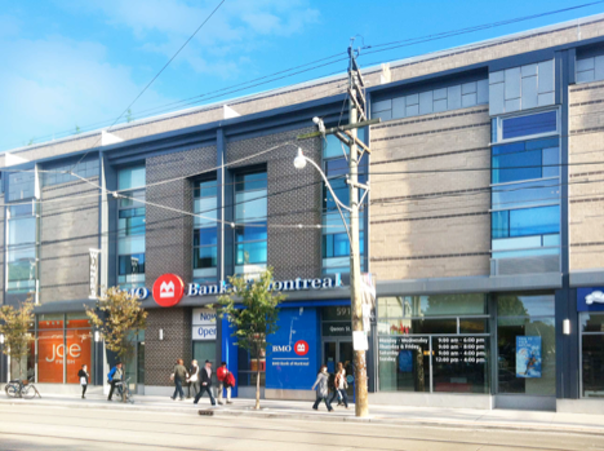 Under the zoning pressure of historical districts such as Queen Street, the approach may still seem a clever device by architects of a certian generation. Against the slick computer enabled architecture of today's new�neo modern work, the postmodern can look fake and badly proportioned. It was a cartoon of a style. There is a lot of public criticism in the community for what Rio-Can has done with the street. �In their defense, they could have just copied the bland minimalist formula down the street at Urban Outfitters - grey brick, silver metal, curtain wall, and avoided the controversy. But no, they somehow just had to do something, and for that I give a courage credit. Excerpts of design guidelines for the Queen West HCD, with infractions in bold. A sense of visual coherence along the street, which results in part from a continuous street wall, defined by the cumulative character of building scale, mass, height, and proportion. Through the design of the fa�ade, new buildings should respect the scale of adjacent Contributing Buildings. Storefronts typically have recessed entrances creating deep display windows that enliven the street. The bays of storefronts and fa�ades should ideally be 4.5 metres wide, and must be no more than 7 metres wide. Heritage building ensembles are divided into bays, giving the appearance of multiple buildings. The variety of individual store signage tends to add a dynamic character to Queen Street West. Large third party signage on the other hand, tends to detract from the�heritage character of buildings. New and renovated buildings must be sympathetic to the heritage character of the built form by respecting the narrow rhythm of fa�ades. This is particularly crucial to large developments. All third party signage and any signage above the ground floor must respect the heritage character of the building and streetscape, including the scale and narrow rhythm of storefronts. Signage must not cover windows. 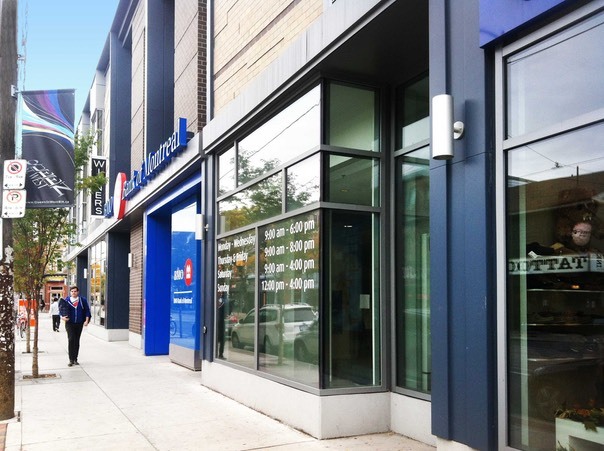 Blank fa�ades detract from the active and engaging character of the street where people frequently enter (and look into) buildings through multiple doors and windows fronting directly onto Queen Street West. A horizontal rhythm and visual transition between floors is articulated in fa�ade designs, through string courses, a change in materials, and a shift in the proportion of glazing. Architectural detailing provides a 3-dimensional texture that creates a play of light and shadows on fa�ades. Upper levels are characterized by less transparency: between 25% to 75%, by windows that are generally vertically oriented. There is often a reduction in glazing from the second floor to the floors above. 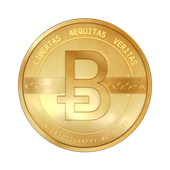 A design ticket is my way of applying critical standards to a project. Some say Toronto lacks design controls, as great zoning recomendations are often sidestepped by the OMB. I seek your approval, in giving the Bohemian Embassy Lofts facade, a design ticket. Infraction 1 - Lack of continuous glazing. In area 1 the openings are only 50% of the street segment. In area 3, they are 80%. This is a signifiant problem, as pedestrian use depends on the street level engagement provided by glased areas of display. I don't mean a glass spandrel or sign, Im talking about something you would want to look at as you walk by, like a dress shop or clothing mannequin. The design is supposed to emphasize the ground level retail. Infraction 2 - Bland solid area surrounds and pilasters to glazing. In area 2, simple brick or steel exit doors are the cheapest material brought into the line of pedestrian sight. We shouldn't have to look at this cheap stuff. Compare this dumb material to the exotic and sculptural infill of the slender pilasters and innovative wood headers between and above windows in area 4 on the North side. Glazing should be framed for emphasis, not merged into the stories above. Infraction 3 - Poor development of solids above the street level. The simple brick and concrete striping �in area 7 is the minimum possible in creating a building face. A change of brick color is all that stops this 3-5 story face from becoming a monotonous block. A Queen Street facade is a rich tapestry of sculpture and decoration as in areas 5 and 6, the cornice. I understand that the art of brickwork is lost now, but there are other materials that can be crafted, such as precast and metal. Infraction 6 - Too many grids. I recommend not gridding surfaces so much. Like crazy tiles in a bathroom, grids collide. �See the simplicity of area 5's for the break between areas of fetish and planar fields in the old north facade. Although the old north side of the street was an accident of design experiments, it compares better as a prototype for the creation of walkable streets in a historic neighborhood. I don't think I'm being unfair, as the same criticisms could be made of many developments on Queen Street, for example the recent Loblaws on Portland and Queen. I can understand the necessity of a bland facade in a suburban area, where people aren't supposed to be out there walking around thinking and getting exercise, but driving at high speed in Corby cars, at high speed on wide asphalt highways, behind tinted windows, listening to tasty fresh new fast food radio advertisements, while dreaming of that Carribbean vacation with all the right people. This family is facing trouble. Not only is their house up for partial demolition due to a zoning violation, but their rising legal costs are now $300,000 in the attempt to fight city hall, over an $80,000 renovation. Some of my clients contact me thinking they can negotiate the zoning bylaw or the building code. I have been able to help them with a building inspector ticket when there is a legitimate zoning interpretation issue, but not an outright violation of the by-laws, as represented in this Toronto Star article. Building anything without a permit when required is very risky. 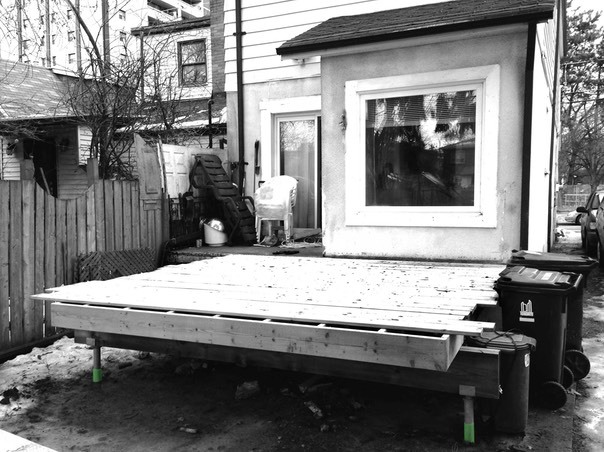 The ontario building code - OBC - �empowers the municipality to tear down your offending structure, and then lien your property with the cost. This is, of course, after long due process. Ignorance of the law is not a defense, as Mr. Tseng has found out. Some owners feel if they simply replace what is built there already, then it must be legal, as this poor family did. This is a common mistake. 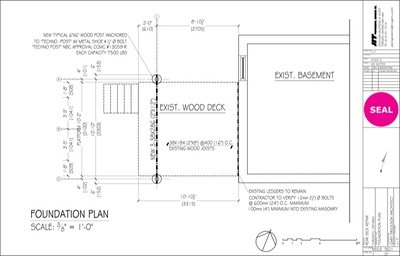 Zoning changes frequently, and your building project is taken to the most recent standard. If your house can no longer be built that deep on the lot, and you have done so, then it must be demolished. If Mr. Tseng had only been able to contact the city before building their addition, then they could have saved him a million dollars in the end, and all the stress and health risk to a fragile older couple. Once passed, the zoning compliance is approved for the design, defending against future changes to the bylaws. I would ususally work with a code consultant on the latest zoning and OBC regulations for your property, to save you money and time. The city would review your intended renovation for compliance, with confidence that all is in order. Although in some cases a complete rebuild of an addition is illegal, if they had retained a few of the original walls, then it may have counted as a renovation, not an addition. Call an architect when renovating your property, and save yourself the time and trouble of a fight with city hall. 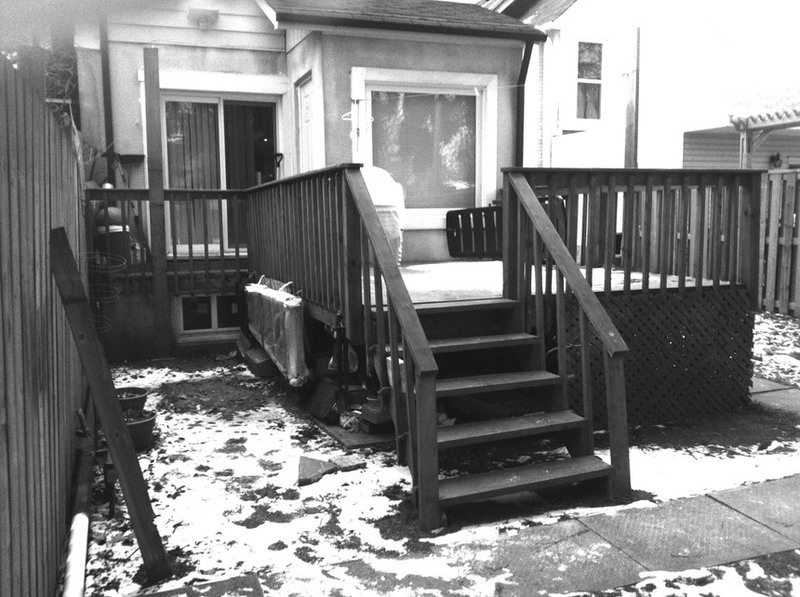 The family that has fought for six years to prevent the demolition of an illegal backyard home addition has filed another appeal to the Ontario Municipal Board, which rejected the first appeal in 2008. "We don't hurt anybody. The neighbours, the city speak out like we are very bad person. We are not bad person. We just want our addition allowed. We don't have anywhere to go," Shih Tseng said Monday. Shih Tseng, 76, lives in the Brunswick Ave. house with his disabled wife, Yang Tseng, 70. Yang Tseng suffers from serious mobility problems, depression and anxiety, and a Parkinson's-like brain disorder. Shih Tseng says they need the addition to allow Yang Tseng to live comfortably on one floor. The Tsengs built the two-storey, $80,000 addition without permits in 2006. Their attempts to get it retroactively legalized have been dismissed by the city's committee of adjustment, the OMB, and the courts. Shih Tseng maintains the family did not know that permits were necessary. 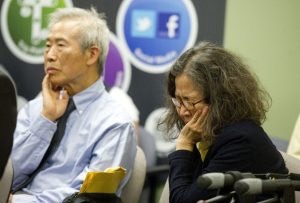 Neighbourhood opponents are dubious, noting that daughter Pauline Tseng is a lawyer (who now owns the property and filed the new appeal under her name) and that Shih Tseng himself is a retired realtor. Shih Tseng says the family has spent about $300,000 on the legal battle. Councillor Adam Vaughan says city officials have told him the battle has cost the city about $500,000. City lawyers will attend the OMB hearing to oppose the new appeal because the previous council decided to have city lawyers oppose the original appeal, spokesperson Ellen Leesti said. "This second appeal is in substance the same as the first appeal," she said. Vaughan and Rory "Gus" Sinclair, former president of the Harbord Village Residents' Association, have urged the Tsengs to stop. "The Tsengs will do what they will do - extraordinary as they may be for pursuing this yet again when they have lost at every turn already," Sinclair said in a text message. "What I am unhappy with today is a process that has denied them at every stage and yet those proceedings are not just 'un-final,' all the work and all the time spent by lawyers, volunteers and tribunals is null." The addition is about the same size as a rotting old addition the Tsengs tore down. But it runs 10 meters deeper into the backyard than allowed under current bylaws, and the city says it blocks sunlight and views from adjacent properties. At a committee of adjustment meeting in July, lawyer Clayton Ruby argued that requiring the Tsengs to demolish the addition would amount to discrimination against the disabled. He suggested that Yang Tseng might be at risk of committing suicide if she were forced to move. The committee was unswayed by Ruby's human rights arguments. But the Tsengs' lawyers plan to raise them anew at the OMB, Ruby's colleague Gerald Chan said Monday. The Tsengs appealed to the courts after the OMB rejected their original appeal. They were unsuccessful, but a judge allowed them to try their luck once more at the committee. Vaughan and Sinclair believed the committee meeting was the Tsengs' last hope. The judge actually gave them the right to make a second appeal to the OMB. If the OMB denies this appeal, the Tsengs can then ask the courts to hear a final appeal. The family has also made a plea to the United Nations Human Rights Committee.